Cloned from Hangar by Jamie Place (FontBlast). Clone of Hangar, with holes in that I find look rather like gunshots! Info: Created on 27th September 2012 . Last edited on 27th September 2012. Nice work, the bullet holes are islands though and make that this is technically not a stencil. How about submitting your wonderful Gridder instead? @four: I would have, but I missed the deadline. Never ind, it's alright. 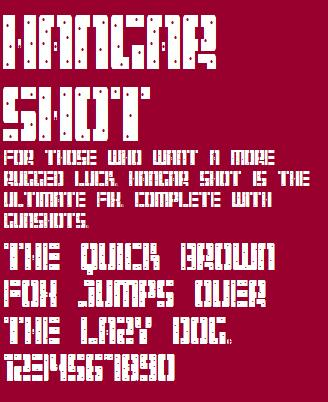 Please also look at my other fonts.